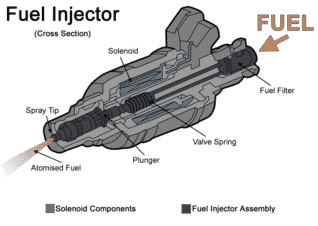 A fuel Injector is a vital component of the fuel-injection system found in almost all modern gasoline powered cars. A fuel injector plays the role of delivering fuel to the car’s engine and most of the time when the car has a bad fuel injector, people conclude that the engine is faulty, whereas it is only the fuel injector that is damaged. In this guide, we will look at the basics of a fuel injector and how can you diagnose and take preventive steps to increase the lifespan of the fuel injector. Your car’s engine makes use of an internal combustion process to produce power and utilizes two key elements: oxygen and fuel. The oxygen is acquired from the air surrounding the engine, while the fuel is taken from the fuel reservoir. The air intake does the job of supplying air to the engine and since the oxygen supply varies, the job of fuel injection system is to constantly vary the amount of gasoline to be delivered according to the oxygen supply. What Role does the Fuel Injector Play? The fuel injector is responsible for delivering the right amount of gasoline to the engine as per the requirement and also vary the amount if the requirement fluctuates. The fuel injector works like a valve and is electronically linked to the engine control unit. The engine control unit signals the fuel injector to open its nozzle and spray the required amount of gasoline for the efficient combustion process. Fuel injectors can get clogged if there is a large debris build up inside the injector. This usually happens in the form of rust and does not allow the fuel to pass through the injector. The only way to solve this issue is removing the fuel injector and having it cleaned by a professional. The fuel injector gets dirty over the time when hydrocarbons and additives present in the fuel combine with carbon and leave a residue. These elements burn and form a crust which disturbs the gasoline flow and in turn reduces the engine performance. In case of a dirty fuel injector, you can buy ‘injector cleaners’ to clean a worn out injector instead of buying a new one. A rusty or broken fuel injector might not open its valve in order to deliver the fuel. In this case, it is recommended to replace the injector. A problem with the fuel injector spring can cause it to remain open and allow gasoline leakage. This happens due to rust buildup because of the additives and hydrocarbons present in the fuel. Due to overheating or any other issue, a fuel injector also starts to leak gasoline which in turn disrupts the engine performance. Since the fuel injector is directly linked to the engine, any problem with the fuel injector causes a disturbance in the car performance. Here are some symptoms which you might notice due to a bad or faulty fuel injector. One of the most obvious symptoms is that the “check engine” light on your dashboard will blink. If any of the fuel injectors become clogged or dirty and is not delivering fuel to the engine efficiently, an electrical signal is sent to alert the driver. Please note that the check engine light can also be activated due to various other reasons, thus it is recommended to take your car to an auto repair shop and have it scanned for trouble codes. If your check engine light blinks, check your trouble code memory with an OBD2 code reader. They do not cost that much and you can read the trouble code memory at home. If the engine does not receive adequate fuel, it will start to vibrate once it finishes one complete cycle. For turbocharged engines, a clogged or dirty fuel injector can have a dangerous impact causing engine-damaging detonation. When the engine is in turbo mode at a higher RPM, it requires a great deal of fuel and if the fuel injector is unable to deliver that, a detonation may occur causing turbo failure. The engine misfires when the fuel injector is dirty, clogged or does not open properly. A misfiring engine will cause disturbance to acceleration, reduce fuel efficiency and will also result in loss of power. This requires immediate attention as your engine could also overheat and eventually stall. This symptom occurs due to fuel injector leaks or if the fuel injector does not close properly. The excess of gasoline produces a bad smell which is noticeable while driving. If you regularly monitor your fuel consumption, you’ll notice a drop in the fuel efficiency due to a bad fuel injector. A faulty fuel injector will deliver more than required fuel to the engine reducing the car’s mileage. Uneven supply of fuel due to the bad fuel injector will cause the RPM to drop resulting in a shaky drive. Fuel injectors do not last a lifetime but there are some maintenance steps you can take to ensure that they stay in good condition for a longer period of time. Experts recommend that the fuel injectors should be cleaned after every 30,000 miles so that they don’t clog. Always make sure that your fuel filter is replaced when the scheduled service is saying it is time. If you are not sure when to replace your fuel filter, check your service manual. Another way to avoid clogging is using premium high-quality gasoline. The cheap gasoline blends have added detergents and additives which cause clogging. Moreover, if you find out that the fuel injector is dirty, have it serviced professionally through ultrasonic cleaning to remove all the debris. This is comparatively cheaper than spending $300 on a new fuel injector. Most of the modern engines use high-tech sensors and computers which adjust the fuel mixture even if the fuel injector isn’t functioning properly. Thus, early symptoms of clogging can go unnoticed. The best way to check is by manually inspecting the condition of the fuel injector. If you have any other questions about fuel injectors, comment down below. If you have any other car questions you are welcome to ask us at our homepage.